When I first asked Alivia what kind of party she wanted this year, she said “Hello Kitty”. Now, if you know me, you know I loathe characters…even my kids know this about me. Call me a terrible mother, but there was just no way I was gonna buy a bunch of Hello Kitty party decor, and I definitely had no interest in spending the time DIYing one to make it slightly cuter. You see, I’m a low key kinda mom. 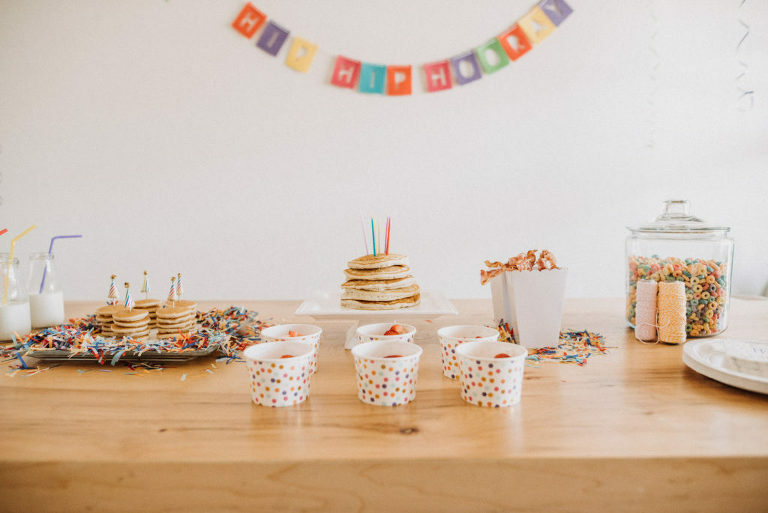 I’m gonna put in just enough effort to let my kids know that I love them and want to create something special for them, but not too much effort so they grow up with expectations that every party or event is gonna be a huge production. Gotta find the balance. 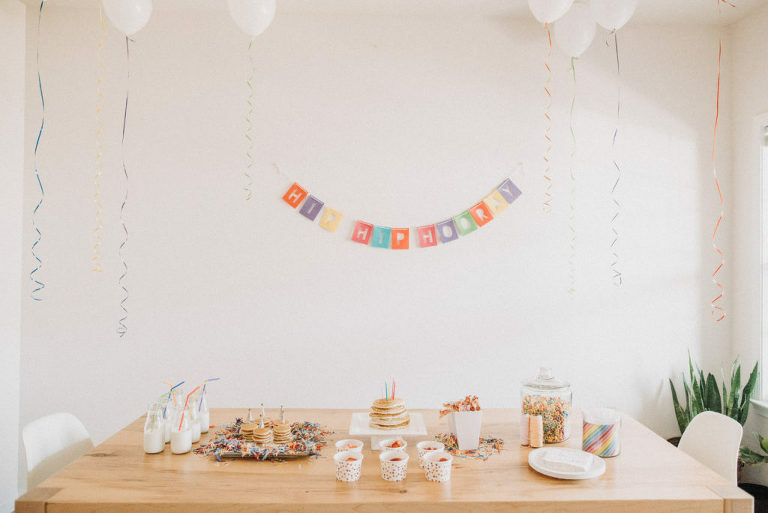 I took to Pinterest (of course) to come up with a party theme that was cute and simple. Thus, Pancakes & Pajamas. She loved the idea, and I had a huge sigh of relief knowing I wasn’t going to be cutting out a bunch of kitty faces and throwing hot pink and glitter all over my house. When I asked her what colors she wanted to do, she said “pink and purple” *insert meh face*, then said “no wait, RAINBOW!”, which is pretty fun! 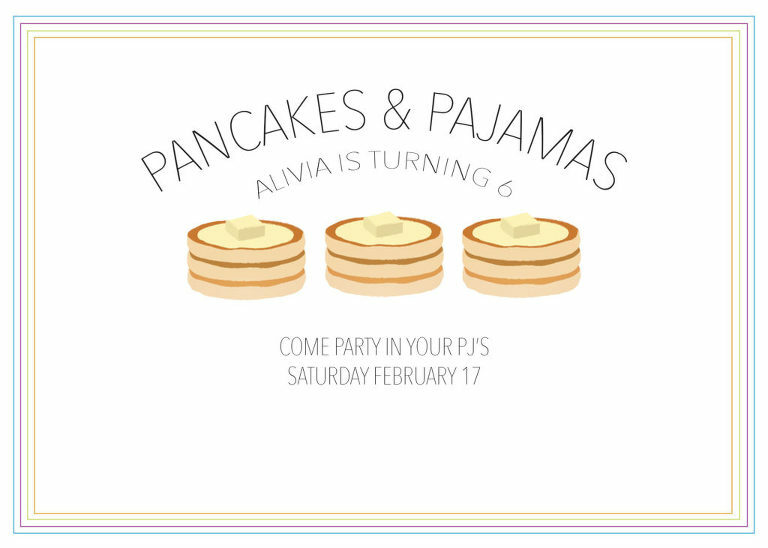 So here’s what a low-key, low-budget Rainbow Pancakes & Pajamas Party looks like. Just threw this one together in Photoshop, but Etsy had a ton of really cute options, like this one. The banner and napkins were from the dollar bin at Target. The polka dot cups were also a dollar bin win, but I had bought them last year for Liv’s donut party, and we just didn’t end up using them. The confetti was some that I had shredded a couple years ago when I had a party decor Etsy shop and contemplated selling confetti in it. (Yeah, definitely too time consuming for me.) One of my favorite items was the party candles in the pancakes, which I purchased from my favorite store in downtown Savannah The Paris Market. Then I put the fruit loops and string out not only for decor, but so the girls could make cereal necklaces as an activity. The party hat toppers were from Michaels, along with the milk bottles, which I’ve used for multiple parties and activities. I try to purchase things that I know I can use multiple times and get my money’s worth out of, like the cake stand and milk bottles. Well, OBVIOUSLY we had pancakes, Krusteaz Buttermilk to be exact, and then to simplify things for myself, the mini pancakes are frozen ones by Eggo. I fried up some bacon, cut up some strawberries, and called it a day. It was the least amount of work I’ve put into party food, which was nice to not be up until 2am baking the night before. The only complication with breakfast food was having everything hot and ready when everyone got here, which I failed at, but luckily 6 year olds don’t make a huge fuss about hot food. Overall, I was super excited how cute things came together despite my minimal effort. 😉 And now my little lady is one year older, and I can’t quite wrap my head around the fact that I’m old enough to have a 6 year old.